A total of 70 polls have been published since the formal start of the election campaign on 30 March. This graph may appear rather inconclusive, but look closer and you can spot a few trends. 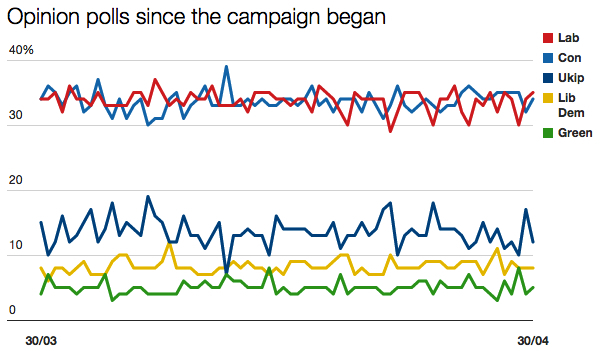 Labour has had far more spikes downwards than upwards in the second half of the campaign. The party has touched 30% or below on five occasions, whereas in the first half of the campaign it never dipped below the early-mid 30s. The Tories have hauled themselves up a couple of points or so. No longer are they troubling the early 30s; almost all of their ratings of late have been in the mid-30s. But they are not achieving any spikes upwards – at least, nothing to match that sudden (and undoubtedly rogue) jump up to 39% earlier in April. Neither the Tories nor Labour have established a consistent lead, but this too is significant. There has been no “crossover”, something the Tory party campaign team – perhaps unwisely – publicised as inevitable. There has also been no swing back towards the mainstream parties: another trend that was foretold over-confidently by a number of pundits. Instead the three smaller parties have maintained a fairly steady presence in the polls, albeit bouncing around between a range of scores that, in the case of Ukip, has ballooned as large as 11 percentage points. 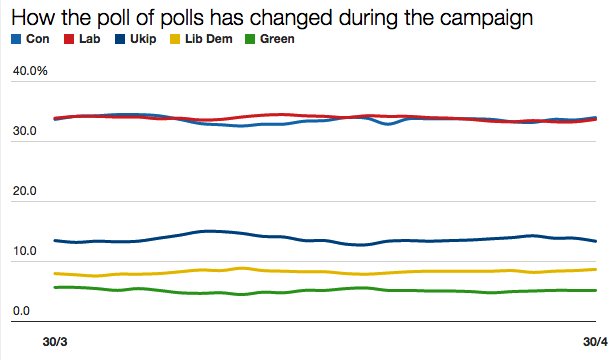 Labour has led the poll of polls on 15 occasions; the Tories on nine occasions. Trying to make sense of the polls this past year has never been dull. Quite the reverse. It’s been fascinating, it’s been bemusing, it’s been maddening. And in less than week it will be over. I shall welcome the clarity, but I shall certainly miss the intrigue.